By Barney Hoskyns. Broadway Books. A biography of a self-mythologized character like Tom Waits is a daunting task. The intertwined aspects of his art and public persona can't be easily pried apart, and part of the attraction such a figure has is precisely that mystique. Former MOJO editor Barney Hoskyns makes a valiant, well-researched attempt, despite the handicap of being denied full access to musicians who worked with Waits in the latter part of his career. It's surprising that a figure of Tom Waits' prominence hasn't merited a full-fledged in-depth biography like this before. From the start of his career Waits was an odd man out. He was nurtured in the folk club scene in San Diego, and though he eventually played in the same clubs and recorded on the same record label as other L.A. based singer/songwriters (he had his first hit as a songwriter with the Eagles' cover of Ol' 55), he was uneasy with the country rock cocaine cowboy vibe. A devotee of pre-rock Tin Pan Alley songwriters and the Beat writers, Waits wrote songs that were occasionally just this side of beatnik parody, and for a time he self-consciously tried to live the boozy life he sang about while ensconced in the Hollywood Tropicana Motel, becoming involved in a volatile relationship with chanteuse Rickie Lee Jones and a brief fling with Bette Midler. On the cusp of the ’80s he met his wife and collaborator Kathleen Brennan, cleaned up and settled down, and contrary to the typical self-destructive rock cliché, produced his most daring and creative music. Influenced by the music of Captain Beefheart (who Brennan introduced him to), hobo composer Harry Partch and Kurt Weill, the three-record run of Swordfishtrombones, Raindogs and Frank's Wild Years reinvented Waits' music, broke him out of the self-described "Wino guy" persona that had become a straitjacket, and made him into the cult figure he is today. 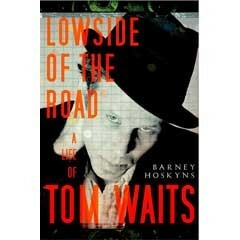 Hoskyns also unearths fascinating details about his relationships with the wide variety of collaborators who helped burnish Waits' legend over the years: Francis Ford Coppola, who used Waits as a member of his stock company for a time and basically jump-started his side career as a movie actor; avant theater director Robert Wilson; beat legend William S. Burroughs; and simpatico pals like indie director Jim Jarmusch and Keith Richards. The paucity of access is most apparent in the coverage of the era post-Swordfishtrombones, in which Hoskyns has to rely on Waits' earlier producer Bones Howe and disaffected musicians (most notably longtime Waits mainstay Ralph Carney) to provide track-by-track commentary. In his later years Waits had become an intensely private family man, and most of his public interviews were entertaining but unenlightening shtick. Hoskyns has done as good a job as possible of getting behind the mask to the life of the man.